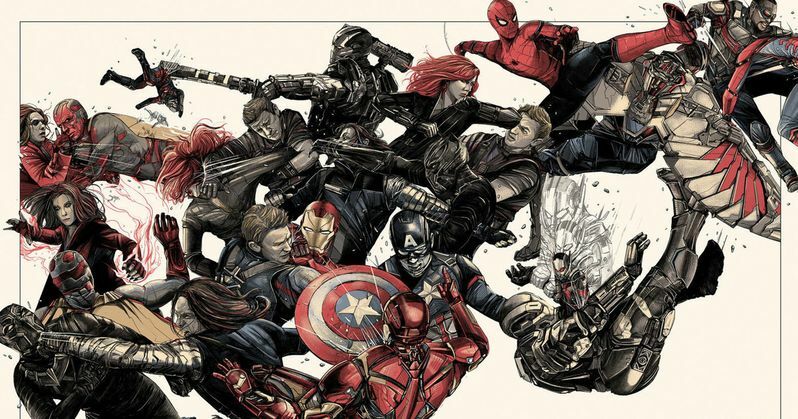 Mondo is celebrating the tenth anniversary of the Marvel Cinematic Universe in a major way. The gallery, which is located in Austin, Texas, has eleven brand-new epic MCU posters on display and up for sale. The celebration is called Marvel Studios: The First Ten Years and will run for one week, ending on October 20th. So, if you're in the area and a Marvel fan, you should definitely check this event out. Mondo's Marvel Studios: The First Ten Years was first announced back in September and previewed some of the posters that were going to be up at the event, starting with Cesar Moreno's print for the first Iron Man film. The awesome poster features Tony Stark constructing the very first suit with the iconic red and yellow coloring that the hero is known for. However, now all of the posters that are up at the event have been released online, showing off some pretty awesome artwork. Amien Juugo's poster for the first The Avengers film puts the focus on Loki as he holds the Tesseract. Pictured below the looming image of the sometimes villain is the core group of Avengers, including Iron Man, Black Widow, Thor, Hawkeye, Hulk, and Captain America. There are two variants of the poster, with the second version having a darker tone. Francesco Francavilla's Captain America poster is made to look like an old classic movie and is filled to the brim with details and characters from the film. Steve Rogers is shown facing a star with his shield at his back. Marc Aspinall created two variants for his Captain America: Winter Soldier poster featuring an epic battle. The second version of the poster has more of a muted color than the original. Oliver Barrett's Captain America: Civil War might be the coolest one out of the bunch. The Avengers are fighting each other in a giant cluster as Black Panther, Ant-Man, and Spider-Man are brought into the mix. There are also two variants of this poster as well, with the second version in all black and white with the exception of the red coloring. Johnny Dombrowski tackled Doctor Strange and made it look like an old comic book, while Rich Kelly's take on the first Guardians of the Galaxy takes a darker approach. Other posters shown off at the event are a cartoon take on Guardians of the Galaxy Vol. 2, Spider-Man: Homecoming, another set of Iron Man posters with a second variant, and Thor. All of the posters are unique, but with the same style that we've come to expect from Mondo. It's also important to note that each of the prints is limited edition, so if you want one, you're going to have to act fast. You can check out the posters below, thanks to the Mondo Twitter account. Mientras hacía el hilo del Blu-ray se han confirmado posters oficiales de MONDO para celebrar el 10 Aniversario de Marvel Studios. Hay dos de Black Panther pero no se pueden mostrar. Os lo pongo en orden cronológico.